The archipelago of dormant volcanoes, quaint beaches, and a throbbing nightlife makes Bali one of the best destinations to visit in Asia. Bali attracts travellers from all around the world. Whether it is a bachelor’s party, honeymoon, shopping in Bali or a solo budget backpacking trip, Bali has everything that a traveller wants to experience. While Bali is the hub of adventure sports and party scenes, a visit here is incomplete without going on a shopping spree. 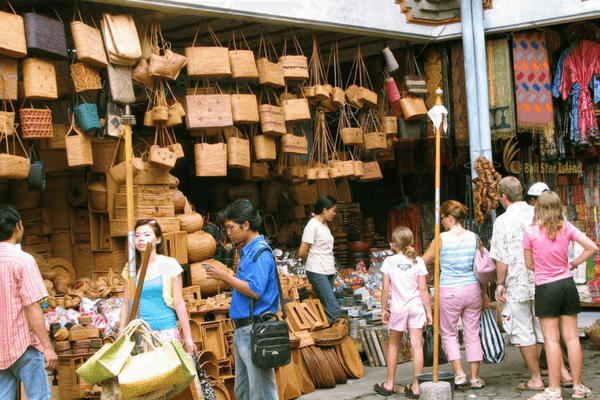 Bali’s indigenous shops, handicraft markets and handmade jewelleries make shopping in Bali an exhilarating experience. Different shopping destinations of Bali specialize in unique products. 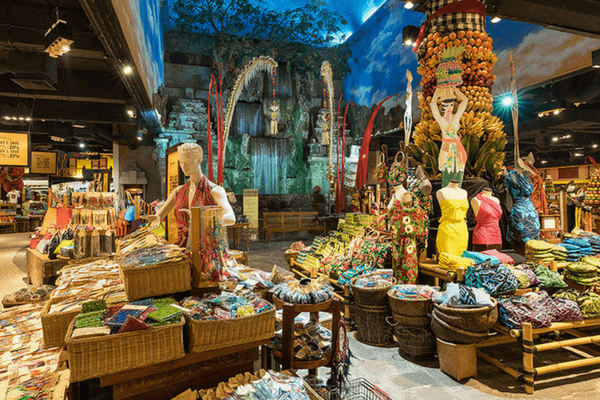 Here is are some of the best places where you can go shopping in Bali. Located at Kuta Roundabout, The Mal Bali Galleria is a central shopping hub. This popular mall and entertainment centre is a perfect place for the entire family to spend some time in leisure. With a slogan of ‘enjoy, play, eat, shop’ this shopping centre is the perfect venue for a family outing. Mal Bali Galleria comprises of various restaurants, bookshops, fashion outlets, a Hypermart, cineplex, souvenir shops and stores of local artisans. One can also enjoy regular art exhibitions in every the premise of the mall. ‘PasarSeniUbud’ or popularly known as the Ubud Art Market is located next to the Royal Ubud Palace. This art market is the most crowded shopping destination of Bali as Ubud is the most recommended part of every Bali tour package. This vibrant market is bustling with tourists who come here to purchase ethnic products. Ubud Art Market will introduce you to the locals of Bali who come here to sell their handmade goods. One can find easy bargains on silk scarves, lightweight shirts, handmade woven bags, baskets, hats, statues, musical instruments, handmade jewellery and a lot more. Most of the articles found in Ubud Art Market is locally manufactured by the villagers of Pengosekan, Tegallalang, Payangan, and Peliatan. When you are in Bali a visit to Ubud Art Market is inevitable. Its proximity to the Royal Palace brings every tourist here who ends up buying a souvenir or two. Ubud Art Market shuts down by the evening so it is recommended that you visit here in the morning. 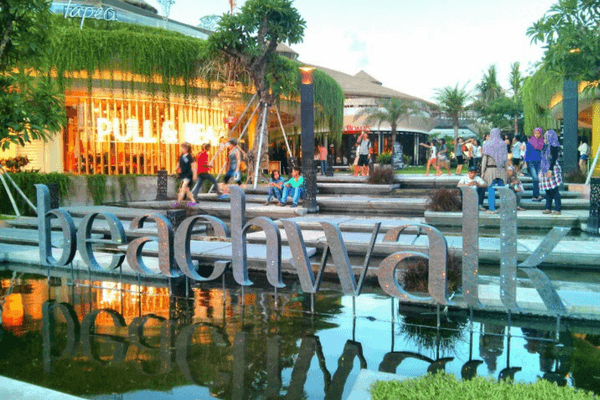 Kuta Beachwalk is a recreational zone which spans across 3.7 hectares of land along with a 250-meter street side near the end of JalanPantaiKuta. It is a fun-filled venue that hosts several shops, restaurants and entertainment zones for the visitors of all age. Kuta Beachwalk is the perfect Bali shopping venue if you are looking for latest Dolce & Gabbana, Louis Vuitton or Van Heusen. 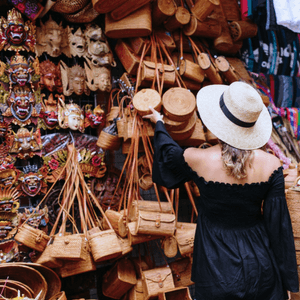 The tourists visiting Kuta can find the most high-end premium products in the shops as well as the local handmade products from Balinese people. The Beachwalk is also the home of the few of the luxury resorts, The Harris Resort is located at a walking distance as well as the upcoming Sheraton property is situated in the proximity itself. If your daily life runs and operates on coffee then trying the legendary Kopi Luwak coffee is one of the essential things to do in Bali. 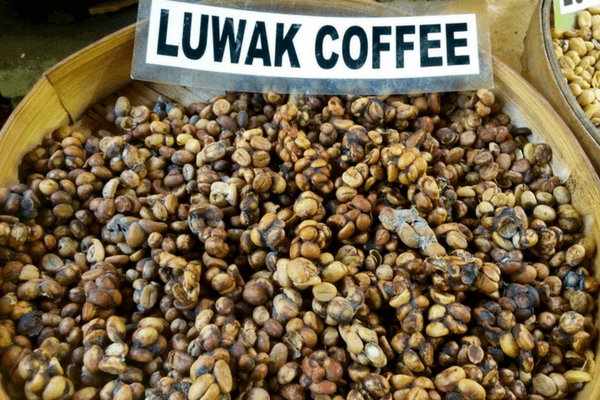 The especially manufactured beans of Kopi Luwak are the best to be purchased during your visit to the Kintamani coffee farms. Your Bali shopping should include the experience of taking some Kopi Luwak home. You can also take a day trip to Ubud’s Teba Sari Plantation and purchase coffee beans, local herbs, and spices at very nominal prices. Most of the Bali tour packages provide a visit to the local coffee farms. Apart from Kopi Luwak, Bali is famous for its coffee plantations and roasteries. The coffee shops of Bali are known to serve the best espressos and lattes and one can also try the different styles of coffee prepared by the coffee masters. The roasteries also sell their manufactured coffee beans and you can take them home for very cheap and nominal prices. Sukhavati art market is one of the most enduring shopping zones of Bali. 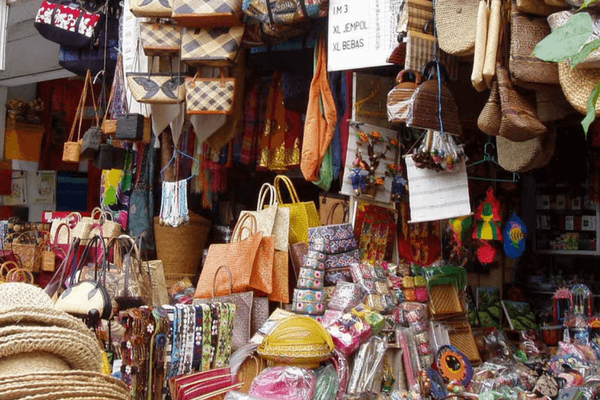 This market is filled with shops selling local handmade products and one can buy souvenirs for gifting purposes. This market has shops that sell items made of bamboo, jewellery manufactured using local stones and other handicraft items. The Sukhavati art market is an important destination for those who want to go shopping in Bali, so watch out for this place during your visit. One of the prime reasons why Sukhavati art market attracts so many visitors is because of this culturally rich atmosphere. This market has a bohemian vibe attached to it. This market has everything beautiful and ornate. Items like sculptures, pottery and paintings can be found in abundance over here. These products are created by local artisans who reside in the neighbouring villages. 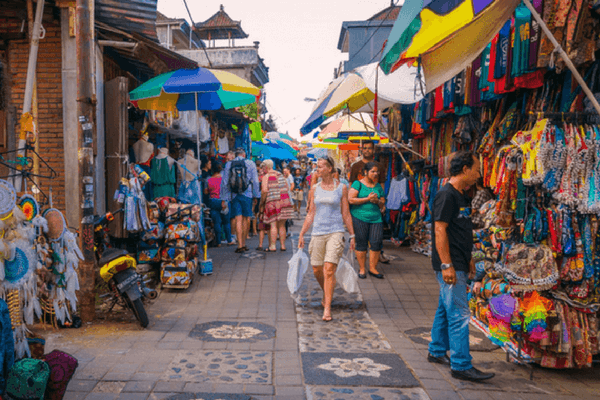 Kumbasari Market is the destination for the travellers who have planned for shopping in Bali and mainly want to purchase local textiles, clothing, costumes, religious attires and ceremonial dresses. Located in Denpasar, the bazaar of Kumbasari is one of the prime locations of Bali. 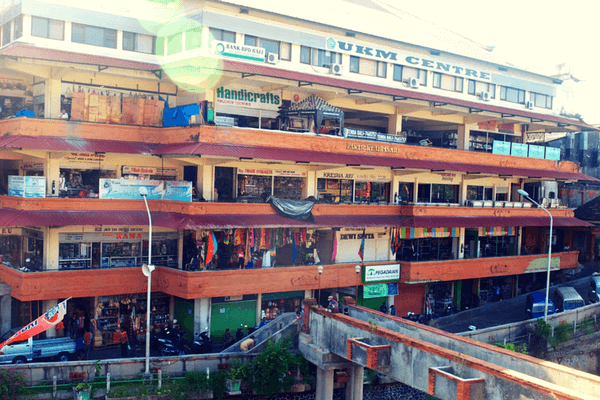 The market is accessible to tourists who can come here taking a short walk from Badung Market. It is also known as Peken Payuk or the Pot Market because it sells every kind of item which is manufactured using clay and ceramic. You can also take a pottery making class with your loved one. The local pottery classes provide you with an ethnic experience of Bali. Located on Jl. Gajah Mada, Badung is the largest, longest-operating market in Bali. You can add a local flavour to your Bali holidays and explore this hustling bustling market. This market is open 24×7 and is a popular location to explore the local lifestyle of the archipelago. Fresh farm produce as well as meat, fish, seafood, groceries, textiles and household items are sprucely available here. One of the reasons why it attracts so many tourists is because of its fabric shops. A tourist can one can buy local handmade dresses as well as the traditional attires of the Balinese populace at Badung. It is the mini version of the Kuta Art market. While smaller in size, the products sold in this market are no less than its counterpart. Because of a lesser known status compared to other markets of Bali, the price of the products are fairly low and the bargaining is easier. 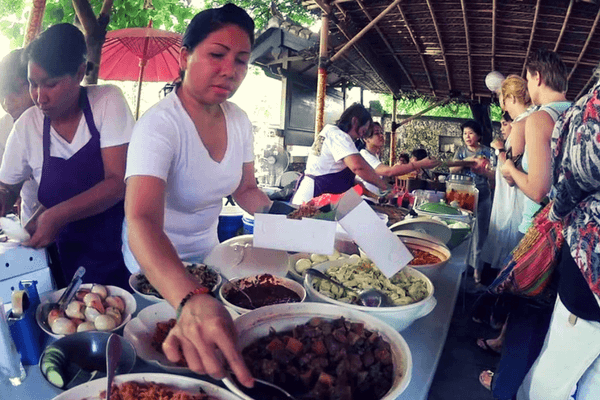 Trying the local food here is one of the best things to do in Bali. 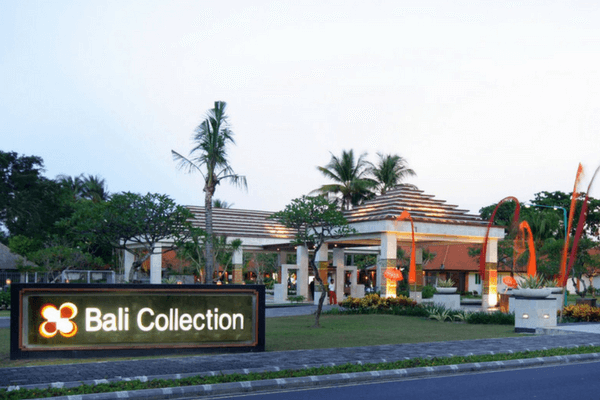 Bali Collection is a lavish shopping and dining hub located in the same enclave as the headquarters of Bali Tourism Development Corporation. It has an array of items ranging from local made and international fashion products, handicrafts and souvenir shops. Those who wish to try the local cuisine of Bali can try amazing delicacies like babi guling, nasi campu and nasi goring amongst the few. Anyone who loves everything glittering and shimmering needs to visit Celuk because of its premium jewellery shops. 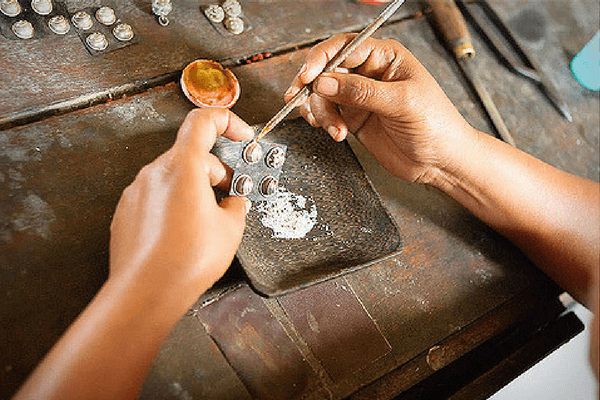 Celuk Village is the home of the goldsmiths and silversmiths and their offices are located in this part of Bali. Bali tourism promotes Celuk village as a place where one can catch a glimpse of the local heritage. The local village population is skilled in sculpting gold with intricate designs and patterns. You don’t even need to visit the trader shops; but can directly purchase the products from the home of the villagers itself. You can also ask your travel agent to add a trip to this village in your Bali holiday package. Bali is a shopper’s paradise. A visit to this beautiful island is incomplete if you return without carrying huge bags of souvenirs for yourself and your friends. Always make sure that your Bali holiday package has a leisure day so that you can visit these markets in peace. The local markets not only provide you amazing products but are also perfect for taking a glimpse of heritage and lifestyle of the natives. Going on a shopping spree is one of the best things to do during your Bali Holidays. Bali attracts travellers from around the world with it's mystic destinations. Shopping in bali is a dream come true for every shopaholic.